Is Mexico Safe? Is it Safe to Travel to Mexico? Home › About San Carlos › Is Mexico Safe? Read first hand accounts from people who have recently visited and / or live in Mexico, and know that Mexico is Safe, fun and affordable. San Carlos is safe, Cancun is Safe, Puerto Vallarta is Safe …. come enjoy Mexico. Roberto Gracida Jr.: I totally agree…Mexico is Safe .. and Fun!! Oralia Martinez: Mexico is simply Wonderful!!!!!!!!!! Robert Hilton: Never a problem in 30 years of travel to San Carlos, Sonora. Safer than my home in Denver. Kellie Rich: We just came north from San Carlos and the first question friends ask in the USofA is if we had any problems south of the border. The answer for the 4 years we have been going back and forth is no problems. Be reasonable and be safe is the key ! Pam Brame: I love the people of Mexico, they are happy, friendly, humble and family & Christ is number 1. Even when driving north or south I have never been harassed at any of the check points in MEXICO. They are always there with a smile and a laugh. It’s the life style here, is what we love and the people. We have a community of like minded people, Active retirees, what more can we ask for. Great people, Great Food, The Ocean, the Beauty of San Carlos not to mention all the activities here and organizations that help the needy. Norene Sullivan: Happiest place on earth, right here! San Carlos…come see for yourself. Becki Mulkey Burr: The US is selling fear – don’t buy into it….San Carlos, Sonora is beautiful, quiet, slower paced, cheaper to live, gorgeous vistas of both Mountains and sea. I travel requently to the US and back, even by myself, and have never – in 10 years – felt the least bit of fear. We come from a small town in Kansas…..I honestly believe it is safer here than there. Pat Walsh: I live in San Carlos, Sonora, eight months a year and feel safer there than I do at home in Northern California. There is virtually no crime where we are and we leave our doors and windows open…because we can. Driving from Nogales is as safe as can be and I have never experienced even a hint of apprehension. Mexico is safe. Nancy Sutherlin: I love Mexico, my home. Manny Sanchez: Rocky Point/Puerto Penasco is Safe. Karen Stewart: I moved from Colorado Springs to San Carlos, Mexico 7 1/2 years ago and feel safer in Mexico than Colorado. I love it here. The people here are very family oriented, friendly and go out of their way to help you. I have never had any problems while driving in Mexico. We are only 4 hours from the border. Wonderful place to be. Frank Vale Sr: mexico is safe. MaryLou Austin: All good in San Felipe. I usually travel by myself thru Mexicali and on down to SF. Once I was stuck in the sand south of Mexicali in my little Honda ~ 3 Mexican men stopped and lifted the car out of the sand. The US spreads fear propaganda for their own ends. Make your own decision and come to beautiful Mexico!! 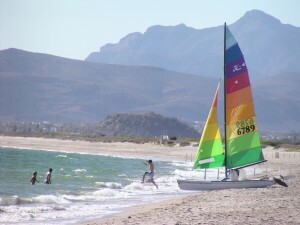 Esmeralda Villa Morales San carlos Sonora, is a wonderful place to visit. is just a paradise!!!!!! very safe! You can read the most recent travel warning here. Over the years, there have been a lot of rumors in the news about Mexico. By now, everyone is probably aware of the travel advisory for Mexico and has read an article from the US media’s campaign against Mexico. But what is the real story from people living and vacationing in this great country? Mexico is a huge country that 110 million people call home. Within that, several border towns have experienced drug cartel violence. The US media has tried to create the perception that all of Mexico, including favorite sun and beach destinations, is dangerous. Part of what started the media frenzy was the U.S. Department of State’s Mexico Travel Alert. The U.S. Department of State issued a travel alert (their lowest level of warning) on February 20th, 2009 about travel to Mexico. It says, in part, “While millions of U.S. citizens safely visit Mexico each year (including thousands who cross the land border every day for study, tourism or business), violence in the country has increased recently……..Common-sense precautions such as visiting only legitimate business and tourist areas during daylight hours, and avoiding areas where prostitution and drug dealing might occur, can help ensure that travel to Mexico is safe and enjoyable”. I have lived in San Carlos, Sonora, Mexico for over eight years, and I can report first hand that the claims of violence and disorder are extremely exaggerated. The information in some US media does not reflect the reality of my life in paradise. Each week, I can kayak with dolphins, scuba dive with sealions, play softball with a large group of ex-pats, hike, bike, play on the beach, eat at fantastic restaurants (including amazing seafood meals), and watch live bands on the beach while sipping cold cerveza. And in the evenings, after dark (when it has cooled down), I walked around my neighborhood. I have never feared for my safety. The only thing I was in danger of was a sun burn. I drive to Hermosillo, the capital of Sonora, at least once a month. I have never experienced or seen any problems and have never felt threatened or unsafe. I was once pulled over by a police officer who politely said “drive slower please” and let me continue on my way. I find that the majority of Mexican people are extremely helpful, kind and generous. My sister and nephew and parents often visit me. I would not encourage them to travel here if there was any chance that they would be in danger. And I’m not the only one who feels safe in Mexico. I have polled readers on whether or not they feel safe traveling to and/or living in Mexico. These are people who know the situation first-hand, and not just from media reports. The overwhelming response was that readers feel safer in Mexico than they feel in the US and/or Canada. They speak strongly about how secure they feel in Mexico. Since the Travel Alert was issued, the U.S. Department of State has tried to clear up some of the confusion. Gordon Duguid, then Acting Deputy Department Spokesman stated at the Daily Press Briefing on March 13, 2009 that, “the violence in certain areas along the borders is of concern. We have made our concerns known in our Travel Alert. I would point out, however, that it is localized. I would also point out that the violence is a response to President Calderon’s strong action against drug cartels. These cartels wanted to have things their own way, and the president refused to accept that and has taken them on, and they have responded with violence. Some of the violence is between the gangs themselves, and some of it is against the police and the other law enforcement authorities. So while we are concerned about the violence in these localized areas, we congratulate the Mexican Government for taking on the problem. And we note in our Travel Alert that American citizens should be aware of the problems in these areas, but that also the – their travel does not need to be hindered if they have the information that they need”. Responding to a question about Secretary Clinton’s visit to Monterrey, and whether this is some kind of signal of the Department’s assurance to U.S. citizens that Mexico is safe to travel to, Gordon Duguid stated, “I think that you can judge that if we did not feel somewhere was safe, that we would not take our Secretary there. So I think it does make that statement”. At another briefing, Gordon Duguid repeated, “We’ve said that Mexico is a safe country to travel to. I’ve said that from this podium and so has Robert Wood, my colleague”. Further, “the U.S. State Department believes that President Calderon is in full control of his country”. Peter Kent, Canada’s junior foreign minister, echoed these sentiments, stating in an interview, “You can see that certainly the conventional tourist spots, the major tourist locations, don’t have any more risk involved than at normal times”. Arthur Frommer, publisher of the famed travel guides, recently traveled to Mexico and stated that, “In actual fact, the resort areas of Mexico … have experienced no violence directed against tourists and are, in fact, almost totally serene, as I myself witnessed on a recent stay. It is as safe to vacation in the tourist part of Mexico today as to go to any city of the U.S. or Canada”. On a per capita basis, the United States ranks 8th, while Mexico is 39th. Reporting that all of Mexico is not safe based on violence in three or four cities, is like saying that the United States is dangerous based on the crime statistics for New Orleans (209 murders in 2008), Detroit and East Las Angeles. In 2008, more Americans died in New Orleans (one city) than in all of Mexico. The US media has also sensationalized a U.S. military planning report issued in January misinterpreting it to say that Mexico was in danger of becoming a “failed state”. Unfortunately, fear sells papers. The document, however, explicitly states that, “This document is speculative in nature and does not suppose to predict what will happen … “. The document was meant to prompt creative planning and policies that would avoid the “what if?” scenarios. Dennis Blair, the Director of National Intelligence, has since reported that, “Mexico is in no danger of becoming a failed state”. Secretary Clinton stated, after her recent visit to Mexico, that, “I don’t believe that there are any ungovernable territories in Mexico”. Mexico is not a failed state, and the majority of cities are extremely safe. Tourism is still strong in Mexico as millions flock to sea side resorts and cobble-stone cities. Last year 22.6 million foreign tourists safely visited Mexico (17.6 million of them Americans). This was a 5.9 percent increase over 2007. Mexico’s Tourism Board states that, “Mexico remains the number one destination for Americans and the occupancy rates in resort areas during the first two months of this year have been higher than last year. Tourism is the third source of foreign revenue for our country and therefore safety of international and national tourists is of our up most priority”. Spring break has now come and gone with thousands of students safely enjoying all that Mexico has to offer. Not only is Mexico safe to visit, it continues to be an amazing, fun, sunny, warm and affordable place to go on vacation. Come see for yourself! 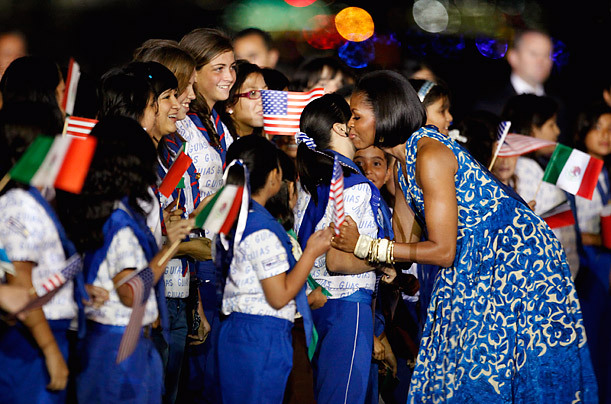 Michelle Obama Declares that it is Safe to Travel to Mexico. This video is a interview with Michelle Obama about how safe Mexico is. Q: if you didn’t have all the security that you have, would you bring your daughters here for a vacation — do you think that this is a safe country for Americans to visit? San Carlos is safe, beautiful, relaxing and fun!